Leabank Square Cootlings Doing Well!! The nesting island on our riverbank has raised two families this season!! Now that last years swans (http://leabanksquare.blogspot.co.uk/2011/04/leabank-square-swans-expect-triplets.html) found somewhere safer to nest - a family of coots - as well as a family of mallards took advantage of the British Waterways Nesting Island. The coots had 5 eggs in their nest - and all of them were hatched in mid May. One of them was definitely weaker than the rest - and didn't survive a particularly heavy downpour one night. One disappeared a few days afterwards - but the 3 rd was seen being carried off by a seagull - so maybe that happened to both of them. So the family has 2 cootlings now - and they're almost as big as their parents - with a lot more fluff about them. But they look very healthy - and are still very protected by mum & dad! To see the daily battles being played out by the parents to keep other coots, passing swans, loads of gulls, and the olympic patrol boats - spend a very enjoyable hour up on the riverbank. It's very entertaining!! Many of us feel like Leabank Square is under siege!! The Lea Towpath & Cycle path has been shut. This is despite the fact that the Olympics have 4 metre high electric fences, thousands of CCTV's cameras, dogs patrolling inside, vigilante boats sailing up & down, very noisy & irritating helicopters circling etc, etc - they still see the need to shut off the main cycle & pedestrian route for thousands of people daily. Add to that - now we have to stare at these soldiers marching up & down the riverbank all day & night. Still - it's probably better tan seeing the previous G4s plastic police that used to walkie-talkie along up until they cocked up their contract with the ODA. So while Mayor Boris is encouraging us to all walk, jog & cycle to work each day - you can only do it alongside the highly dangerous trucks, buses and rat-run cars thundering down Berkshire Road. Sccop: Pigeon Poos on Olympic Rings!! 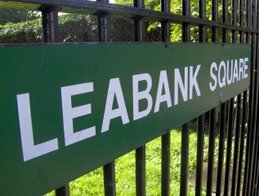 Leabank Square Residents Speak Out! Some of us Leabankers had a chat with Bryn Phillips on 5 April, 2012 about how we felt we were managed. This is his report for Shifting Grounds (http://shiftinggrounds.org/) - a very lively 'politics 4 the people' kind of website. Thanks to everyone who spoke so passionately about our situation - I think he captured some of our feelings in that spirit!! It’s an unusually hot spring afternoon in east London. As colourfully painted barges chug past the new Olympic Media Centre and day trippers wave from the boats, I find myself standing with a youngish woman in a slightly ramshackle – but nonetheless luscious – communal garden on the banks of the canal. And things are getting radical. I’m visiting Lea Bank Square Community Garden, on the edge of the Olympic Park, and a plan is being discussed to form a new Civic Parish for the neighbourhood that would bring democracy closer to home. Originally a forlorn strip of derelict land along the Great Hertford Canal, the community garden we’re standing in began twelve years ago, when a fed-up rates-payer cut the locks on the gate and squatted it for the residents. As an act of public repossession, this sums up the ethos of active citizenship that feels so tangible amongst the inhabitants of the square. Perhaps at the time they wouldn’t have imagined their pet project would turn into such a popular, local institution. But with its ‘do it anyway’ attitude and ‘dig for the neighbourhood’ ethos, it has become totemic of the emerging pop-up politics that’s gripped London ever since the financial crash, and regularly draws in visitors from the surrounding estates. As a result of the hard-nosed intervention of their Community Association, they’ve now also got a grant from the Olympic Delivery Authority to re-develop the plot and to upgrade the hitherto neglected communal gardens at the entrance to the estate. There’s also a suggestion to draft in London Citizens for advice on community organising, and vague talk of forming a Tenant Management Organisation is floating around on the breeze. ‘Full self-management would make a big difference to everybody here,’ says a young, single mother I spoke to, as she kept an eye on her daughter playing on the communal green. ‘If everything was done in-house by the residents, that would give everyone the chance to have a fair say,’ she emphasises. This desire for more autonomy seems clearly borne out of the sense that, as tenants, the residents have little say in how their affairs are managed. ‘Across the canal used to be the playing fields for the local children,’ says Keira, who works as an artist nearby. 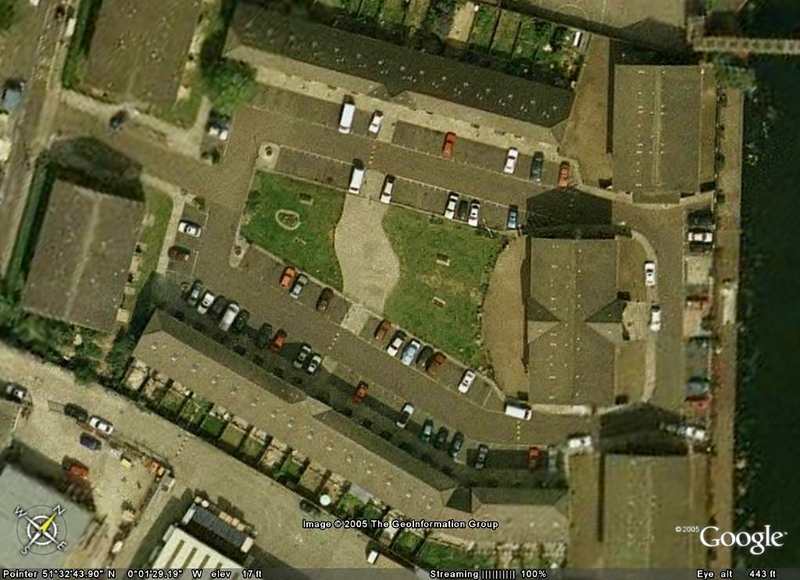 ‘It used to be just open green space. It was lovely. We’ve lost all that now. We’ve just got the ugly media centre instead.’ she says, referring to the Olympic development opposite. Likewise, Dawn, 27, who lives in a ground-floor flat backing onto the canal, isn’t pleased about the cameras that have recently been installed across the water from her. ‘The CCTV over there? I’m not really too happy with it to be honest,’ she says, referring to the Olympic ring of steel, smiling but looking slightly annoyed. As I talk to people I begin to understand where they’re coming from. It’s clear that the feeling of disenfranchisement that abounds around the square comes from a dislike of being micro-managed from above. In contrast, just up the road from Lea Bank Square is the Nye Bevan and Clapton Park Estate – a totally self-managed community since 2003, adorned with homely looking signs, which proudly announce, ‘run by residents for residents’. It is a beacon of hope in an otherwise atomised part of the capital. The striking landscaping that has helped re-define the estate, not to mention the drop in crime rates there, all started from modest beginnings. I start to consider how in a way this echoes the experiments taking place at Lea Bank Square too. The Tenant Board in Clapton can also be proud of the fact that they are among the most effective institutions in Britain. Even when compared to three quarters of local authorities, they’re statistically better at delivering services. ‘We used to be terrified here. It was all guns and drug-dealing,’ says Margaret, a retired carer and local resident. This is a sentiment echoed by John Little, one of the estate gardeners. ‘This is probably the most democratic estate in the Borough,’ he tells me proudly, as we chat in the sweet shop on the shopping arcade. ‘The tenants just stopped Hackney Housing from making this a gated development,’ he proclaims jubilantly, but he also feels the Labour Borough Council isn’t as supportive of local democracy as it could be. Many of the residents I spoke to here also support the creation of a new neighbourhood council for their area, with tax-raising powers. On reflection, there seems to be broad agreement on both estates I visited on the need to relocate decision-making to more immediate units. But it’s important to stress that the problems still blighting some of London’s neighbourhoods are more serious than just poverty of representation alone. Neighbourhood councils need to have muscle and method in order to be proper assets to communities, especially those with high rates of poverty and overcrowding. In the more expensive parts of town, the damaging effects of gentrification and ghettoisation are verging on the chronic. Community hubs are being lost at an alarming rate too: fourteen pubs are closing a day, post offices are disappearing rapidly and youth clubs and other vital community services are all under duress. Having any real impact on the social fabric may seem out of the remit of a parish council. But by becoming institutionalised proponents of community organising schemes, the new parishes could define a more radical role for themselves without overstepping their statutory powers. Listening more closely to local concerns is clearly one advantage to having a neighbourhood council, but as the first tier of local government they could also play an influential role in spreading schemes like the London Living Wage and agitating for radical change. If neighbourhood councils also made it part of their constitution to promote Community Land Trusts, they could do something positive to prevent families being uprooted from the areas they’ve lived in for generations, so that a rich mix of people from different backgrounds are able to live together. In theory there would also be nothing to stop grass-roots councils from campaigning for the formation of local trade associations, something artists in Hackney Wick, who are campaigning for the creation of a modern artists’ guild, would definitely support. Back at Lea Bank Square, we start to chat about the proposal for grass-roots democracy in the area. Not surprisingly, Hazel, 34, endorses the plan. ‘It’s definitely a great idea,’ she enthuses, animatedly. And that’s the most important part. People are desperate for their voices to be heard, and they feel that the existing structures just don’t work for them any more. Testimonials like Hazel’s really bring it home. As Alinsky says, ‘Participation is the heartbeat of the democratic way of life.’ Radical parishes really could herald the start of a common good politics in Britain, a democratic politics that’s established from the grass-roots up. That’s why when it come to the government’s Localism Bill, Labour should steal a march on the Coalition. The transfer of power back to the community should become a key part of how the Labour party articulates its intention to deliver fairness in tough times. In order to achieve this goal, Labour needs to recognise that, as partners, modern civic institutions like TMOs, community organising groups and the modern guilds are as valuable to the present day Labour movement as the unions were one hundred years ago. Leaving the square, I take a last look back at the flurry of activity on the bank side. As the community reasserts itself amongst the vegetation, the good society seems to be literally sprouting out of the ground. And with all the discussion I’ve heard of reinventing democracy here, and longing for civic reformation, I’m convinced it’s time Blue Labour hit the streets and seeded itself inside the parish. As the gardeners of Lea Bank and Clapton Park have demonstrated, it’s time to get back to basics and let the radical tradition take root. Many of us know Kiera for her stunning garden in the courtyard - but now you can see another of her many talents down in Stour Space. 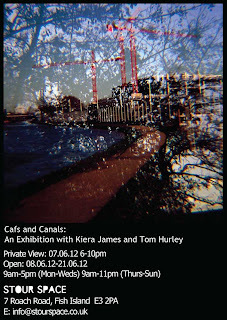 Some of us were lucky to see her exhibition over the canal in John Lewis - but now it's just a short stroll along the canal to see even more amazing photos. 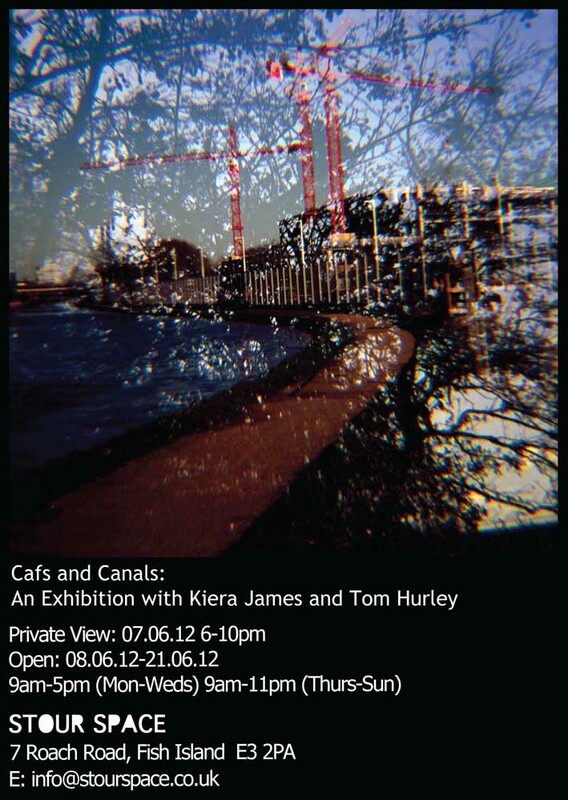 Stour Space presents ‘Cafs and Canals’, an exhibition of photography by Kiera James and Tom Hurley. Time Out's ‘First Thursdays’ Top 5 exhibitions for June. ‘Lower Lea Exposures’ is a series of images documenting the regeneration of the Lower Lea Valley in east London in the run-up to the 2012 London Olympics. Realised in 2010, the images capture a fleeting moment in time as the construction begins to change the face of the area forever. The double exposures were taken on a Diana+ ‘toy’ camera and reflect on the transformations taking place and the relationship between the industrial, natural and historical. The results are somewhat fragmented yet dreamy photographs that encourage the viewer to take a step back and reflect on the area’s ambiguous beauty. Kiera James is an artist with a background in documentary photography, and draws on this tradition in her fine-art based practice. She completing a BA (Hons) in Photography at the University of East London in 2010 and is currently doing an MA in Fine Art at Camberwell College of Art. The series serves as a record of the dwindling world of small, independent shops. These unique spaces exist in harmony with their surroundings and maintain a strong sense of place. Many of the owners ‘wear’ their shops like overcoats – the businesses being almost an extension of themselves. Tom is a professional photographer and a born and bred East Londoner. Born into a family of dock workers, he has spend most of his adult life here. He originally trained in Fine Art, studying at Central College of Art and Hornsey College of Arts and Crafts before developing his career in photography. Olympics, LSCA, Conditional Grants? What does it all mean? 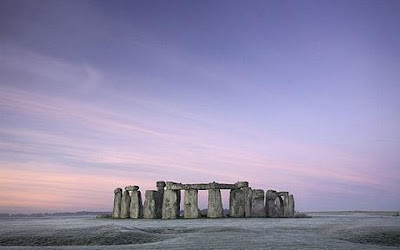 Happy Shortest Day of the Year!! There was very bad news today for all the kids who designed the Leabank Square Gardening Club noticeboard (http://leabanksquare.blogspot.com/2010/03/leabank-square-recycled-notice-board.html) when some vandals destroyed it. Sometime in the afternoon they struck and destroyed the beautifully painted recycled noticeboard. Unfortunately no-one saw who did it - but a few of the younger Gardening Club members told me that they saw it fly-tipped in the domestic bin area. To rub salt in their wounds - the vandals seem to make their destruction even crueler by throwing the destroyed noticeboard in our own refuse area!! Perhaps they are trying to make some kind of point? Anyhow - once the spring comes along again we'll do an even better one for the garden. The Daily Mail - predictably calls it an immigrant - the rest of us marvel at this incredibly beautiful visitor to Leabank Square. A couple of these Hummingbird Hawk Moths were sucking nectar from the Verbena in the Purple Garden on the riverbank this morning. Please do yourself a favour and go up to have a look. They are absolutely stunning!! You can see why they are named after the Hummingbird - they hover above each tiny flower sucking as much nectar from them as possible. The long proboscis even resembles the Hummingbirds beak! According to the Butterfly Conservation website (http://www.butterfly-conservation.org/Moth/440/Moth.html?MothId=100) they come over from North Africa - and sometimes hibernate here over the winter. Thanks to the kids in the Gardening Club - there are plenty of hidy-holes for them do that this winter - here's hoping!! I'm not too sure how long they're going to hang about - so get up to the Purple Garden as soon as you can to check them out! !